Happy Tuesday, and welcome to The ThINKin' Spot. It's Tuesday, and it's Peachy Keen Challenge Tuesday at that. We've got a great sketch to follow for challenge #57, and it's a challenge with a twist of an awesome color combo. Here's the card I created using PK-212 Happy Turtle from Peachy Keen Stamps. I colored him with my Copic markers, cut him out and popped him up on foam dots for dimension. The card stock for the circles was run through the Big Shot using a textured embossing folder, then punched with circle punches in sizes 1 3/8 inch, 1 1/4 inch, and 1 inch. The patterned paper comes from Basic Grey's Sweet Threads paper pad, and the sentiment comes from Stampin' Up! 's Fabulous Phrases stamp set. I inked the edges of the circles with ink to match the color of the card stock, and finished this card off with rhinestone embellishments. Below is the sketch and color combo to follow, and I really hope you can play along with us. It's always fun to see each individual's interpretation of our challenges, and our design team has some wonderful inspiration for you. 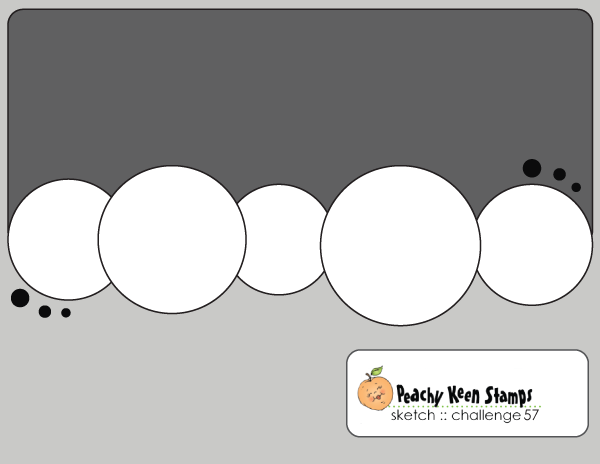 Just drop by the Peachy Keen Challenge Blog and check out what they've done with this challenge. You'll be happy you did. Be sure to stop by and welcome Cathryn, who is our guest designer this week. 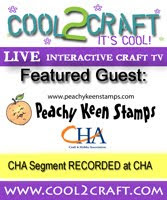 Oh my does she ever do some wonderful things with her Peachy Keen stamps!!! Sorry my post is late today. Seems like I completely lost a week, because I totally forgot today was challenge day!! I guess I need a keeper! Thanks so much for stopping by. Have a blessed day, and happy, happy stamping! OH My Word...This is just to stink-en cute!! Fabulous coloring and love the background. Phew! You had me worried for a while Lorie. I always look forward to your PK projects and this is a prime example of why!!! I'm gonna nail your foot to the floor when I see you, so you can teach me the art of colouring so beautifully!!! oh how fun! I've missed your wonderful cards and happy posts... Much to much time away from the blogs. I love the layout of this one - what a fun way to use the sketch! Hugs and love to you sweet Lorie! Viv you better bring to nails because I got the other foot!!! Are you kidding me?? Seriously??? I was going to sell my Copics but now I am gonna keep them so I can drain your brain! This card is flippin' perfect. I wouldn't change a thing!! Actually I would...I would change that it is at your house and not mine! Lorie you did a great job with this challenge!